I think it’s time I tell you guys- I’m in the process of building a new website and blog. A place where all my inspiration and passion can be found in one place, and also where my illustrations can be shared and purchased. I am so excited about all that this teeny little outlet has become and I’m giddy at the thought of its next steps. I came across this quote posted by a friend of mine this morning and it literally (note to self: work on proper use of the word “literally”) shot straight to my spirit and soothed it like honey soothes a sore throat and The Pointer Sisters soothe a bad day. This blogger world is a big place. My daily reads are brilliant, witty, inspiring, beautiful, and so ahead of the game that picturing myself and my lil’ ol’ blog growing makes me want to run and hide in the corner. Even though I’m stepping out of my comfort zone, I know that we have been called to be a light in whatever way we shine brightest. Artwork, fashion, and faith aren’t generally found in the same place, but that’s me. It’s all who I am, and if I can inspire just one person then everything will be worth it. Comparing is just one of the worst choices we can ever make. It either leaves s feeling a little too prideful, or bawling on the couch, fist deep in a pint of gelato. Though it’s tempting, let’s just not do it! We don’t know the full back story or just how much time and behind-the-scenes work it took someone we admire to get where they are. Wanna know a trick of mine? Shh, it’s a little sneaky. When I’m trying to get inspiration and a boost of motivation about taking the first step of this new site of mine and I get blindsided by the perfection of a fellow blogger’s site, I dig through their archives. And when I say dig, I mean dig…all the way to back their first post. Being able to see the process from Start to Success is so encouraging! 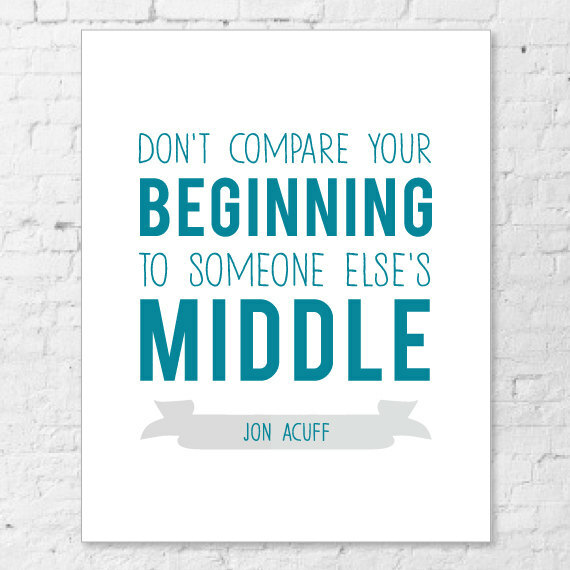 So starting right now, I’m deciding not to compare my beginning with someone else’s middle. You with me? I really needed to read this, so thank you for making this post! Is it weird that I also go through blogger's archives to get motivated? I don't know who that particular blogger is for you, but you're that blogger that I look to for inspiration. When I want to be inspired to work on my writing, I read your blog or look at your illustrations, and it helps, but I feel empty at the same time. I'm definitely going to join you with not comparing my beginning to someone else's middle. Blessings to you and your family! This is so sweet! I'm so flattered to hear that these posts inspire you. Isn't archive digging so encouraging?! I need to go back to my first posts soon just to remember how far I've come. Blessings to you, thanks for following along with me!